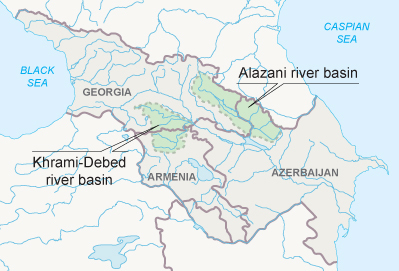 The development of a river basin management plan (RBMP) in the Alazani River Basin was the focus of a workshop held in the Georgian capital of Tbilisi on 5 June. Organised by the International Office for Water within the framework of the EU-funded “European Union Water Initiative Plus for the Eastern Partnership” (EUWI+ East) project, the event focused on the main principles and objectives of river basin management, from planning to implementation. It also served as a platform for coordination between various actors in RBMP development , including surface and groundwater delineation teams. The workshop was attended by the relevant representatives of the Ministry of Environmental Protection and Agriculture and the National Environmental Agency of Georgia. Their counterparts s from Azerbaijan responsible for RBMP, as well as representatives of the contracted companies working on the development of the RBMP and surface and groundwater delineation teams from Georgia and Azerbaijan also attended the event. The EUWI+ East project helps Armenia, Azerbaijan, Belarus, Georgia, the Republic of Moldova and Ukraine to bring their legislation closer to EU policy in the field of water management, with a main focus on the management of trans-boundary river basins. It supports the development and implementation of pilot river basin management plans, building on the improved policy framework and ensuring strong participation of local stakeholders. With a total budget of €24.8 million, the project spans a five-year period from 2016 to 2020, aiming to improve the management of water resources, in particular trans-boundary rivers, and developing tools to improve the quality and availability of water in the long term.